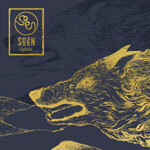 Swedish outfit Soen puts out its third album and takes us through a story based on some rituals taking place in Ancient Greece. Also musically the band follows a particular string, but I wouldn't say that the musical inspiration hails from that part of the world though, even if there are some indications that it does from time to time over the record with certain things. Yet I am very far from being an expert in that specific area and accordingly I prefer to not paint myself into a corner that I can't ever escape from, so I am probably better off focusing on the record's cardinal side instead. Lykaia comprises chiefly songs in a blend of retro, progressive and experimental stuff. It's kind of a slow moving record every once in a while and occasionally I see it as a little bit repetitive too, although it actually isn't really, but it's like it somehow tends to come out through the same kind of atmosphere all the time, where the music is constantly covered by a gloomy aura, and therefore one song becomes close to another in some way. The vocal performance from Joel Ekelöf is pretty unique and he has the ability and presence to go well together with the music. He completes the songs with his kind of easy, yet emotional, style and definitely puts some life to the record and brings it out of its darkened mood a little bit. The first few times I listened to this piece of work I felt like it could develop into something very enjoyable and entertaining and I instantly had high hopes for it turning out to be a great record along the road. Alas, later on it just didn't respond positively to my initial impressions and about 20 attempts further down the lane I've come to a conclusion that even if it is an interesting, and maybe even a bit fascinating, record indeed it doesn't hold the capacity to be amazing, but more just an acceptable product that gets a seal of approval, yet with a small note that a purchase of the record is nothing that earns a top position on the priority list.